If you are going to use Apache Isis for developing complex business-critical applications, then being able to write automated tests for those applications becomes massively important. As such Apache Isis treats the topic of testing very seriously. (Though we say it ourselves), the framework has support that goes way above what is provided by other application frameworks. This guide describes those features available to you for testing your Apache Isis application. unit tests exercise a single unit (usually a method) of a domain object, in isolation. integration tests exercise the application as a whole, usually focusing on one particular business operation (action). Unit tests help ensure that you are building the system right. The natural language specification then maps down onto some glue code that is used to drive the application. But the benefits of taking a BDD approach include the fact that your domain expert will be able to read the tests/specifications, and that when you run the specs, you also get documentation of the application’s behaviour ("living documentation"). It’s up to you whether you use BDD specs for your apps; it will depend on your development process and company culture. But you if don’t then you certainly should write integration tests: acceptance criteria for user stories should be automated! When we talk about integration tests/specs here, we mean tests that exercise the domain object logic, through to the actual database. But we also want the tests to exercise the app from the users’s perspective, which means including the user interface. For most other frameworks that would require having to test the application in a very heavy weight/fragile fashion using a tool such as Selenium, driving a web browser to navigate . In this regard though, Apache Isis has a significant trick up its sleeve. Because Apache Isis implements the naked objects pattern, it means that the UI is generated automatically from the UI. This therefore allows for other implementations of the UI. If the test invokes an action that is disabled, then the wrapper will throw an appropriate exception. If the action is ok to invoke, it delegates through. What this means is that an Isis application can be tested end-to-end without having to deploy it onto a webserver; the whole app can be tested while running in-memory. Although integration tests re (necessarily) slower than unit tests, they are not any harder to write (in fact, in some respects they are easier). Isis provides autowiring dependency injection into every domain object. This is most useful when writing unit tests; simply mock out the service and inject into the domain object. Isis can inject into this even if the field has package-level (or even private) visibility. We recommend that you use package-level visibility, though, so that your unit tests (in the same package as the class under test) are able to inject mocks. Apache Isis also supports automatic dependency injection into integration tests; just declare the service dependency in the usual fashion and it will be automatically injected. A good test should be 5 to 10 lines long; the test should be there to help you reason about the behaviour of the system. Certainly if the test becomes more than 20 lines it’ll be too difficult to understand. The "when" part is usually a one-liner, and in the "then" part there will often be only two or three assertions that you want to make that the system has changed as it should. For unit test the "given" part shouldn’t be too difficult either: just instantiate the class under test, wire in the appropriate mocks and set up the expectations. And if there are too many mock expectations to set up, then "listen to the tests" …​ they are telling you your design needs some work. In the previous section we discussed using given/when/then as a form of organizing tests, and why you should keep your tests small. For integration tests though it can be difficult to keep the "given" short; there could be a lot of prerequisite data that needs to exist before you can actually exercise your system. Moreover, however we do set up that data, but we also want to do so in a way that is resilient to the system changing over time. The solution that Apache Isis provides is a domain service called Fixture Scripts, that defines a pattern and supporting classes to help ensure that the "data setup" for your tests are reusable and maintainable over time. In any given test there are often quite a few variables involved, to initialize the state of the objects, or to act as arguments for invoking a method, or when asserting on post-conditions. Sometimes those values are important (eg verifying that an `Order’s state went from PENDING to SHIPPED, say), but often they aren’t (a customer’s name, for example) but nevertheless need to be set up (especially in integration tests). We want our tests to be easily understood, and we want the reader’s eye to be drawn to the values that are significant and ignore those that are not. One way to do this is to use random (or fake) values for any insignificant data. This in effect tells the reader that "any value will do". Moreover, if it turns out that any data won’t do, and that there’s some behaviour that is sensitive to the value, then the test will start to flicker, passing and then failing depending on inputs. This is A Good Thing™. Apache Isis does not, itself, ship with a fake data library. However, the Isis addons' fakedata module (non-ASF) does provide exactly this capability. Using fake data works very well with fixture scripts; the fixture script can invoke the business action with sensible (fake/random) defaults, and only require that the essential information is passed into it by the test. Writing automated tests is just good development practice. Also good practice is developing on the mainline (master, trunk); so that your continuous integration system really is integrating all code. Said another way: don’t use branches! Sometimes, though, a feature will take longer to implement than your iteration cycle. In such a case, how do you use continuous integration to keep everyone working on the mainline without revealing a half-implemented feature on your releases? One option is to use feature toggles. Apache Isis does not, itself, ship with a feature toggle library. However, the Isis addons' togglz module (non-ASF) does provide exactly this capability. With all that said, let’s look in detail at the testing features provided by Apache Isis. Isis Core provides a number of unit test helpers for you to use (if you wish) to unit test your domain objects. Contract tests ensure that all instances of a particular idiom/pattern that occur within your codebase are implemented correctly. You could think of them as being a way to enforce a certain type of coding standard. Implementation-wise they use Reflections library to scan for classes. This contract test automatically checks that all fields of type java.util.Collection are declared as java.util.SortedSet. In other words, it precludes either java.util.List or java.util.Set from being used as a collection. first, Sets align more closely to the relational model than do Lists. A List must have an additional index to specify order. second, SortedSet is preferable to Set because then the order is well-defined and predictable (to an end user, to the programmer). The ObjectContracts utility class substantially simplifies the task of implementing Comparable in your domain classes. third, if the relationship is bidirectional then JDO/Objectstore will automatically maintain the relationship. To use the contract test, subclass SortedSetsContractTestAbstract, specifying the root package to search for domain classes. (If using the JDO objectstore, then) there is generally no need to programmatically maintain 1:m relationships (indeed it may introduce subtle errors). For more details, see here. Also check out the templates in the developers' guide (live templates for IntelliJ / editor templates for Eclipse) for further guidance. For example, suppose that ParentDomainObject and ChildDomainObject have a 1:m relationship (ParentDomainObject#children / ChildDomainObject#parent), and also PeerDomainObject has a 1:1 relationship with itself (PeerDomainObject#next / PeerDomainObject#previous). The first argument to the constructor scopes the search for domain objects; usually this would be something like "com.mycompany.dom". The second argument provides a map of Instantiator for certain of the domain object types. This has two main purposes. First, for abstract classes, it nominates an alternative concrete class to be instantiated. Second, for classes (such as ChildDomainObject) that are Comparable and are held in a SortedSet), it provides the ability to ensure that different instances are unique when compared against each other. If no Instantiator is provided, then the contract test simply attempts to instantiates the class. If any of the supporting methods (addToXxx(), removeFromXxx(), modifyXxx() or clearXxx()) are missing, the relationship is skipped. To see what’s going on (and to identify any skipped relationships), use the withLoggingTo() method call. If any assertion fails then the error should be descriptive enough to figure out the problem (without enabling logging). The example tests can be found here. If a subclass inadvertantly overrides this method and provides its own ClockService field, then the field in the superclass will never initialized. As you might imagine, NullPointerExceptions could then arise. This contract test automatically checks that the injectXxx(…​) method, to allow for injected services, is not overridable, ie final. This contract test is semi-obsolete; most of the time you will want to use @javax.inject.Inject on fields rather than the injectXxx() method. The feature dates from a time before Apache Isis supported the @Inject annotation. To use the contract test, , subclass SortedSetsContractTestAbstract, specifying the root package to search for domain classes. The ValueTypeContractTestAbstract automatically tests that a custom value type implements equals() and hashCode() correctly. The example unit tests can be found here. then these state changes and interactions with Mocks should have occurred. If using JMock then the interactions (in the "then") are checked automatically by a JUnit rule. However, you probably will still have some state changes to assert upon. For mock interactions that simply retrieve some data, your test should not need to verify that it occurred. If the system were to be refactored and starts caching some data, you don’t really want your tests to start breaking because they are no longer performing a query that once they did. If using JMock API this means using the allowing(..) method to set up the expectation. On the other hand mocks that mutate the state of the system you probably should assert have occurred. If using JMock this typically means using the oneOf(…​) method. For more tips on using JMock and mocking in general, check out the GOOS book, written by JMock’s authors, Steve Freeman and Nat Pryce and also Nat’s blog. Apache Isis' unit test support provides JUnitRuleMockery2 which is an extension to the JMock's JunitRuleMockery. It provides a simpler API and also providing support for autowiring. Isis also includes (and automatically uses) a Javassist-based implementation of JMock’s ClassImposteriser interface, so that you can mock out concrete classes as well as interfaces. We’ve provided this rather than JMock’s own cglib-based implementation (which is problematic for us given its own dependencies on asm). No man is an island, and neither are most applications. Chances are that at some point you may need to integrate your Apache Isis application to other external systems, possibly using old-style SOAP web services. The SOAP client in this case could be a domain service within your app, or it might be externalized, eg invoked through a scheduler or using Apache Camel. While you will want to (of course) perform manual system testing/UAT with a test instance of that external system, it’s also useful to be able to perform unit testing of your SOAP client component. The SoapEndpointPublishingRule is a simple JUnit rule that allows you to run a fake SOAP endpoint within an unit test. The (non-ASF) Isis addons' publishmq module provides a full example of how to integrate and test an Apache Isis application with a (faked out) external system. The idea behind this rule is that you write a fake server endpoint that implements the same WSDL contract as the "real" external system does, but which also exposes additional API to specify responses (or throw exceptions) from SOAP calls. It also typically records the requests and allows these to be queried. In its setup your unit test and gets the rule to instantiate and publish that fake server endpoint, and then obtains a reference to that server endpoint. It also instantiates the SOAP client, pointing it at the address (that is, a URL) that the fake server endpoint is running on. This way the unit test has control of both the SOAP client and server: the software under test and its collaborator. In the test methods your unit test sets up expectations on your fake server, and then exercises the SOAP client. The SOAP client calls the fake server, which then responds accordingly. The test can then assert that all expected interactions have occurred. So that tests don’t take too long to run, the rule puts the fake server endpoints onto a thread-local. Therefore the unit tests should clear up any state on the fake server endpoints. 10 check the fake server endpoint was correctly invoked etc. The endpoint addresses that the server endpoints run on are determined automatically. If you want more control, then you can call one of SoapEndpointPublishingRule's overloaded constructors, passing in one or more SoapEndpointSpec instances. Apache Isis' unit testing support also provides helper JaxbUtil and JaxbMatchers classes. These are useful if you have exampler XML-serialized representations of the SOAP requests and response payloads and want to use these within your tests. 1 Normally test; usual Maven scoping rules apply. using WrapperFactory so that the UI can be simulated. We’ll get to all that shortly, but let’s start by taking a look at what a typical integration test looks like. We typically put the bootstrapping of Apache Isis into a superclass (AbstractToDoIntegTest below), then subclass as required. 2 the todoapp uses AssertJ. 1 again we use the exceptedExceptions rule. Integration tests instantiate an Apache Isis "runtime" (as a singleton) within a JUnit test. Because (depending on the size of your app) it takes a little time to bootstrap Apache Isis, the framework caches the runtime on a thread-local from one test to the next. Nevertheless, we do need to bootstrap the runtime for the very first test. As of 1.9.0 the bootstrapping of integration tests and webapps has been simplified through the AppManifest class. Since this isn’t mandatory, for now we present both techniques. The example code in this section is taken from the app generated by the SimpleApp archetype. The bootstrapping itself is performed by a "system initializer" class. This is responsible for instantiating the Apache Isis runtime, and binding it to a thread-local. While the code is slightly longer than previously, the responsibilities for returning the configuration properties to use for the test now reside in a single location. The new AppManifest.Util class provides the helper methods to actually add in the appropriate config properties. Further details on bootstrapping with the AppManifest can be found in the reference guide. 1 subclass the framework-provided IsisSystemForTest.Builder. 4 IsisConfigurationForJdoIntegTests has pre-canned configuration for using an in-memory HSQLDB and other standard settings; more on this below. 2 binds the runtime to a thread-local. Integration tests are configured programmatically, with a default set of properties to bootstrap the JDO/DataNucleus objectstore using an HSQLDB in-memory database. To remove a little bit of boilerplate, the IsisConfigurationForJdoIntegTests class (in the org.apache.isis.objectstore.jdo.datanucleus package) can be used to bootstrap the application. If necessary, this class can be subclassed to override these defaults. We recommend defining a base class for all your other classes to integration classes to inherit from. The main responsibility of this class is tocall the system initializer, described earlier. We only need the initialization to be performed once, so this call is performed in a @BeforeClass hook. 3 primarily exists to support the writing of BDD specifications, but also enables finer-grained management of sessions/transactions (discussed below). 2 sets up a JMock context (using Apache Isis' extension to JMock as described in JMock Extensions. 4 to capture messages that require translation, as described in i18 support. All of these rules could be inlined in your own base class; as we say, they are a convenience. for tests that check interactions over multiple separate sessions. The WrapperFactory service is responsible for wrapping a domain object in a dynamic proxy, of the same type as the object being proxied. And the role of this wrapper is to simulate the UI. WrapperFactory uses javassist to perform its magic; this is the same technology that ORMs such as Hibernate use to manage lazy loading/dirty tracking (DataNucleus uses a different mechanism). It does this by allowing through method invocations that would be allowed if the user were interacting with the domain object through one of the viewers, but throwing an exception if the user attempts to interact with the domain object in a way that would not be possible if using the UI. the integration test calls the WrapperFactory to obtain a wrapper for the domain object under test. This is usually done in the test’s setUp() method. if the business rule checks pass, then the underlying member is invoked. Otherwise an exception is thrown. The type of exception depends upon what sort of check failed. It’s straightforward enough: if the member is invisible then a HiddenException is thrown; if it’s not usable then you’ll get a DisabledException, if the args are not valid then catch an InvalidException. Let’s look in a bit more detail at what the test can do with the wrapper. Wrapping a domain object is very straightforward; simply call WrapperFactory#wrap(…​). Going the other way — getting hold of the underlying (wrapped) domain object — is just as easy; just call WrapperFactory#unwrap(…​). We’re not sure that’s any easier (in fact we’re certain it looks rather obscure). Stick with calling unwrap(…​)! for object collections the test can call the getter. If there is a supporting addTo…​() or removeFrom…​() method, then these can be called. It can also call add(…​) or remove(…​) on the collection (returned by the gettter) itself. In this respect the wrapper is more functional than the Wicket viewer (which does not expose the ability to mutate collections directly). for object actions the test can call the action method itself. As a convenience, we also allow the test to call any default…​(),choices…​() or autoComplete…​() method. These are often useful for obtaining a valid value to use. What the test can’t call is any of the remaining supporting methods, such as hide…​(), disable…​() or validate…​(). That’s because their value is implied by the exception being thrown. The wrapper does also allow the object’s title() method or its toString() , however this is little use for objects whose title is built up using the @Title annotation. Instead, we recommend that your test verifies an object’s title by calling DomainObjectContainer#titleOf(…​) method. As well as enforcing business rules, the wrapper has another important feature, namely that it will cause domain events to be fired. The wrapper will also fire domain events for properties (if annotated with @Property(domainEvent=…​)) or collections (if annotated with @Collection(domainEvent=…​)). It isn’t possible to use the WrapperFactory in a unit test, because there needs to be a running instance of Apache Isis that holds the metamodel. 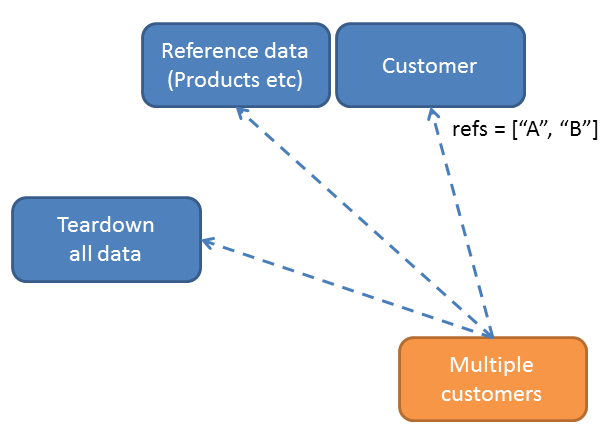 Behaviour-driven design (BDD) redefines testing not as an after-the-fact "let’s check the system works", but rather as a means to work with the domain expert to (a) specify the behaviour of the feature before starting implementation, and (b) provide a means that the domain expert can verify the feature after it has been implemented. Since domain experts are usually non-technical (at least, they are unlikely to be able to read or want to learn how to read JUnit/Java code), then applying BDD typically requires writing specifications in using structured English text and (ASCII) tables. The BDD tooling parses this text and uses it to actually interact with the system under test. As a byproduct the BDD frameworks generate readable output of some form; this is often an annotated version of the original specification, marked up to indicate which specifications passed, which have failed. This readable output is a form of "living documentation"; it captures the actual behaviour of the system, and so is guaranteed to be accurate. specifications are written in the Gherkin DSL, following the "given/when/then" format. Cucumber-JVM itself is a JUnit runner, and searches for feature files on the classpath. These in turn are matched to step definitions through regular expressions. It is the step definitions (the "glue") that exercise the system. The code that goes in step definitions is broadly the same as the code that goes in an integration test method. One benefit of using step definitions (rather than integration tests) is that the step definitions are reusable across scenarios, so there may be less code overall to maintain. For example, if you have a step definition that maps to "given an uncompleted todo item", then this can be used for all the scenarios that start with that as their precondition. There are some key framework classes that make up the spec support; these are discussed below. some of these are also used by Apache Isis' Integration Test support. 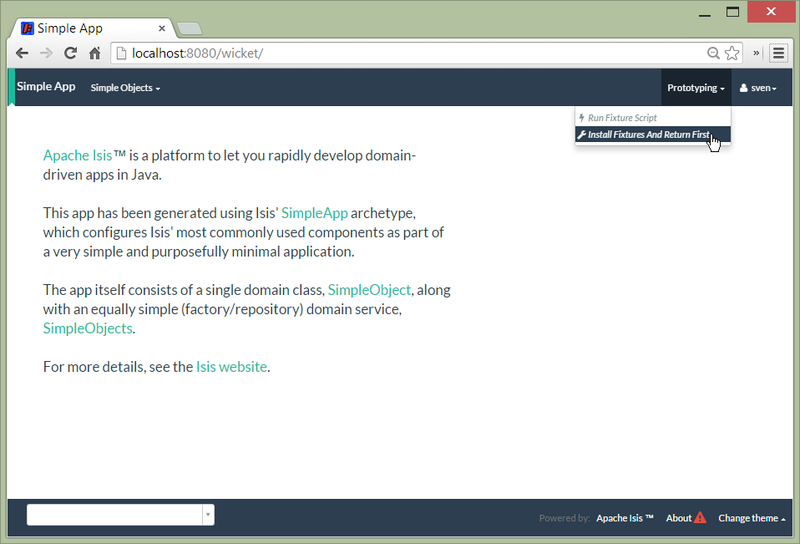 The IsisSystemForTest class allows a complete running instance of Apache Isis to be bootstrapped (with the JDO objectstore); this is then held on a a ThreadLocal from one test to another. Typically bootstrapping code is used to lazily instantiate the IsisSystemForTest once and once only. The mechanism for doing this is line-for-line identical in both BDD step defs and integration tests. The ScenarioExecution provides a context for a scenario that is being executed. It is Cucumber that determines which step definitions are run, and in which order, and so state cannot be passed between step definitions using local variables or instance variables. Instead the ScenarioExecution acts like a hashmap, allowing each step to put data (eg "given an uncompleted todoitem") into the map or get data ("when I complete the todoitem") from the map. This is done using the putVar(…​) and getVar(…​) methods. This corresponds broadly to the "World" object in Ruby-flavoured Cucumber. The ScenarioExecution also provids access to the configured domain services (using the service(…​) method) and the DomainObjectContainer (through the container() method). This could probably be refactored; Cucumber JVM provides automatic dependency injection into setp definitions, but Apache Isis does not currently leverage or exploit this capability. Like the IsisSystemForTest class, the ScenarioExecution class binds an instance of itself onto a ThreadLocal. It can then be accessed in BDD step definitions using ScenarioExecution.current() static method. 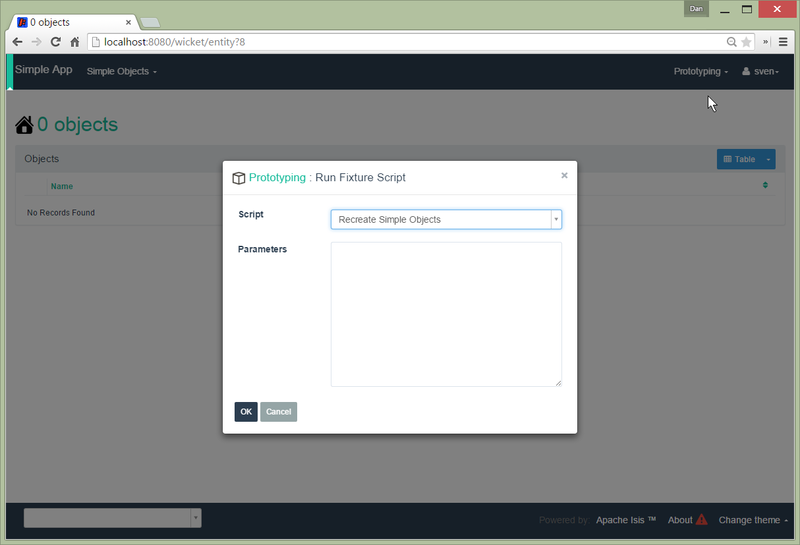 As with integration tests, the UI can be simulated by "wrapping" each domain object in a proxy using the WrapperFactory. The CukeGlueAbstract acts as a convenience superclass for writing BDD step definitions (analogous to the IntegrationTestAbstract for integation tests). Underneath the covers it delegates to an underlying ScenarioExecution. a RunSpecs.java class file to run the specification (all boilerplate). This will run all .feature files in the same package or subpackages. one or several XxxGlue constituting the step definitions to be matched against. The "glue" (step definitions) are intended to be reused across features. We therefore recommend that they reside in a separate package, and are organized by the entity type upon which they act. For example, given a feature that involves Customer and Order, have the step definitions pertaining to Customer reside in CustomerGlue, and the step definitions pertaining to Order reside in OrderGlue. The glue attribute of the Cucumber-JVM JUnit runner eallows you to indicate which package(s) should be recursively searched to find any glue. a system initializer class. You can reuse the system initializer from any integration tests (as described in Integration Test Support, bootstrapping section). The @SimpleObjectsFixture is a custom tag we’ve specified to indicate the prerequisite fixtures to be loaded; more on this in a moment. The @integration tag, meanwhile, says that this feature should be run with integration-level scope. Although BDD specs are most commonly used for end-to-end tests (ie at the same scope as an integration test), the two concerns (expressability of a test to a business person vs granularity of the test) should not be conflated. There are a couple of good blog posts discussing this. The basic idea is to avoid the overhead of a heavy-duty integration test if possible. Apache Isis does also support running BDD specs in unit test mode; by annotating the scenario with the @unit (rather than @integration tag). When running under unit-level scope, the Apache Isis system is not instantiated. Instead, the ScenarioExecution class returns JMock mocks (except for the WrapperFactory, if configured). To support unit testing scope Apache Isis provides the InMemoryDB class; a glorified hashmap of "persisted" objects. Use of this utility class is optional. Writing a BDD spec that supports both modes of operation therefore takes more effort and we expect most users interested in BDD will use integration-testing scope; for these reasons we have chosen not to include unit-testing support in the SimpleApp archetype. For those who do require faster-executing test suite, it’s worthwhile knowing that Apache Isis can support this. The JSON formatter allows integration with enhanced reports, for example as provided by Masterthought.net (screenshots at end of page). (Commented out) configuration for this is provided in the SimpleApp archetype. Note that this is annotated with a tag (@SimpleObjectsFixture) so that the correct fixture runs. (We might have a whole variety of these). If using Java 8, note that Cucumber JVM supports a simplified syntax using lambdas. To help write feature files and generate step definitions, we recommend Roberto Lo Giacco’s Eclipse plugin. For more information, see Dan’s short blog post. It works very well. Of interest: this is implemented using XText. When writing integration tests (and implementing the glue for BDD specs) it can be difficult to keep the "given" short; there could be a lot of prerequisite data that needs to exist before you can actually exercise your system. Moreover, however we do set up that data, but we also want to do so in a way that is resilient to the system changing over time. On a very simple system you could probably get away with using SQL to insert directly into the database, or you could use a toolkit such as dbunit to upload data from flat files. Such approaches aren’t particularly maintainable though. If in the future the domain entities (and therefore corresponding database tables) change their structure, then all of those data sets will need updating. Even more significantly, there’s no way to guarantee that the data that’s being loaded is logically consistent with the business behaviour of the domain objects themselves. That is, there’s nothing to stop your test from putting data into the database that would be invalid if one attempted to add it through the app. The solution that Apache Isis provides is a small library called fixture scripts. A fixture script is basically a wrapper for executing arbitrary work, but that work almost always invoking a business action. If you want to learn more on this topic (with live coding! ), check out this presentation given at BDD Exchange 2014. The following sections explain the API and how to go about using the API. The role of the FixtureScripts domain service is to locate all fixture scripts from the classpath and to let them be invoked, either from an integration test/BDD spec or from the UI of your Isis app. The role of FixtureScript meanwhile is to subclass for each of the scenarios that you want to define. You can also subclass from FixtureScript to create helpers; more on this below. Let’s look at FixtureScripts domain service in more detail first. There are two ways in which you can provide a FixtureScripts service. The original (pre-1.9.0) approach is to subclass subclass FixtureScripts domain service, with your subclass specifying which package to search for. Various other settings can also be provided, and - being a custom class - you can also add in additional actions. A common example is to provide a "one-shot" action to recreate a standard demo set of objects. As of 1.9.0 there is an alternative design. Instead of subclassing FixtureScripts you instead implement the FixtureScriptsSpecificationProvider SPI. (As its name suggests), this provides a FixtureScriptsSpecification object that contains the same information as would otherwise have been in the FixtureScripts subclass. The actual implementation of the FixtureScripts service is then provided by the framework itself, namely the FixtureScriptsDefault domain service, annotated to be rendered on the secondary "Prototyping" menu. This uses the FixtureScriptsSpecificationProvider to adjust itself accordinly. 2 if the same fixture script (class) is encountered more than once, then run anyway; more on this in Organizing Fixture scripts], below. The benefit of this design - decoupling the responsibilities of the superclass and the subclass - is that it ensures that there is always an instance of FixtureScripts available, even if the application itself doesn’t provide one. Some of the (non-ASF) Isis Addons modules (eg Isis addons' security module) expect there to be a FixtureScripts service for seeding data, which has caused some confusion. 5 if the same fixture script (class) is encountered more than once, then run anyway; more on this in Organizing Fixture scripts], below. This isn’t quite equivalent; you would need to write additional code to support the "recreate objects and return first" action, for example. Let’s now look at the FixtureScript class, where there’s a bit more going on. A fixture script is ultimately just a block of code that can be executed, so it’s up to you how you implement it to set up the system. However, we strongly recommend that you use it to invoke actions on business objects, in essence to replay what a real-life user would have done. That way, the fixture script will remain valid even if the underlying implementation of the system changes in the future. 8 call another fixture script (SimpleObjectsTearDown) using the provided ExecutionContext. Note that although the fixture script is a view model, it’s fine to simply instantiate it (rather than using DomainObjectContainer#newTransientInstance(…​)). 10 adding the created object to the list, for the calling object to use. Fixture scripts can be called from integration tests just the same way that fixture scripts can call one another. 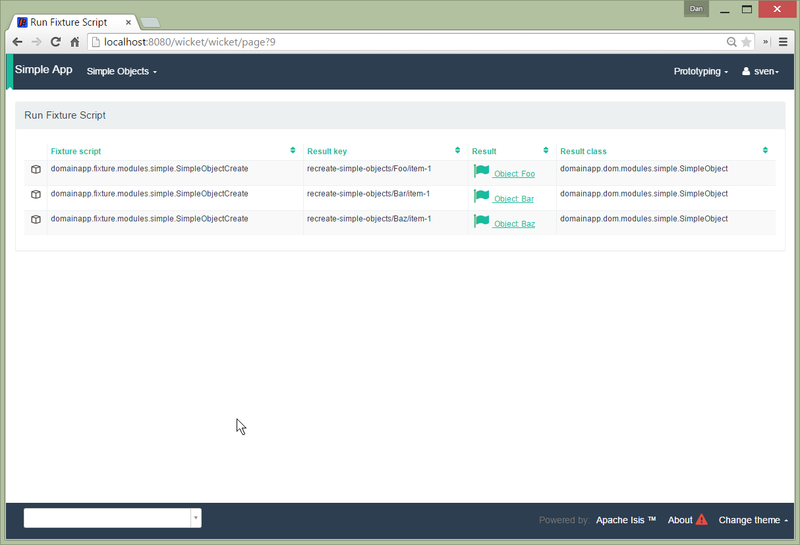 in a "composite pattern" style, eg as in the Estatio open source app. Notice how we have a single script that’s in control of the overall process, and takes responsibility for passing data from one fixture script to the next. We can reuse the same fixture "customer" script, either calling it twice or (perhaps better) passing it an array of customer details to set up. Back in the earlier section we noted the MultipleExecutionStrategy setting. We can now explain the meaning of this: the enum value of EXECUTE is designed for the flat style (where every fixture script will be called), whereas the enum value of IGNORE is designed for the composite style, and ensures that any fixture scripts visited more than once (eg TearDown) are only every executed the first time. 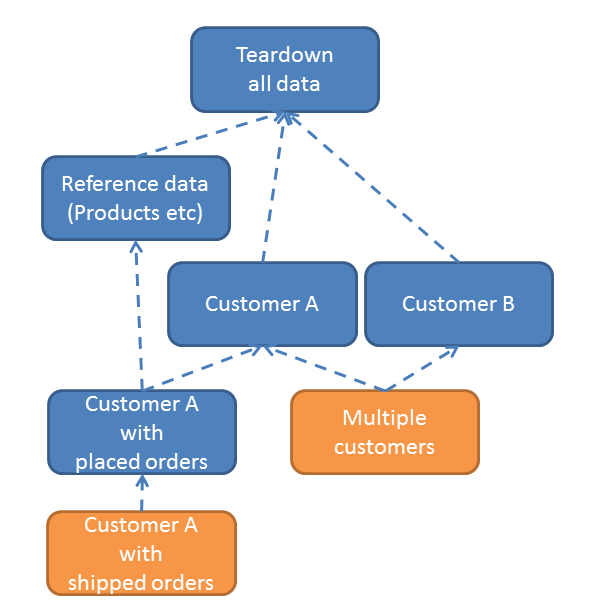 As already noted , the app generated by the SimpleApp archetype uses the flat structure, and we feel that it’s a better at separating out the "how" (how we set up some graph of domain objects into a known state, eg a customer with shipped placed orders and a newly placed order) from the "what" (what data should we actually use for the customer’s name, say). The composite style tends to combine these, which one could argue does not separate responsibilities well enough. On the other hand, one could also make an argument that the composite style is a good way to implement precanned personas, eg "Joe", the customer who has a newly placed order, from "Mary" customer who has none. As of there are two other approaches. The first is to take advantage of a new MultipleExecutionStrategy, namely EXECUTE_ONCE_BY_VALUE. Under this strategy the determination as to whether to run a given fixture script is by comparing the fixture script against all others that have run. If all fixture scripts implement value semantics, then they can effectively determine whether they need to run or not. This strategy was introduced in order to better support the ExcelFixture fixture script (provided by the (non-ASF) Isis addons' excel module. The ExcelFixture takes an Excel spreadsheet and loads up each row. For those cases where we wish to ensure that the same spreadsheet is not loaded more than once, the IGNORE strategy would have required that a trivial subclass of ExcelFixture is created for each and every spreadsheet. The EXECUTE_ONCE_BY_VALUE on the other hand delegates the determination to the value semantics of the ExcelFixture, which is based on the contents of the spreadsheet. The second approach is in recognition that there is, in fact, something of a design flaw with the concept of MultipleExecutionStrategy: it requires that all fixture scripts being run follow the same conventions. There’s a good argument that this shouldn’t be a global "setting": the responsibility for determining whether a given fixture script should be executed should reside not in the FixtureScripts service but in the FixtureScript itself. Thus, the FixtureScripts.ExecutionContext exposes the getPreviouslyExecuted() method that allows the fixture script to check for itself which fixture scripts have already been run, and act accordingly. For this approach, the MultipleExecutionStrategy should be left as simply EXECUTE. Sometimes in our fixture scripts we want to perform a business action running as a particular user. This might be for the usual reason - so that our fixtures accurately reflect the reality of the system with all business constraints enforced using the WrapperFactory - or more straightforwardly it might be simply that the action depends on the identity of the user invoking the action. 1 is the current user. Behind the scenes the SudoService simply talks to the DomainObjectContainer to override the user returned by the getUser() API. It is possible to override both users and roles.